When I saw the production photos of the new BMW i3 electric city car, I couldn't shake the feeling that I had seen it somewhere else before. Then one day, in a flash of brilliance, it occurred to me that this isn't the first time BMW has tried a lightweight, rear-engine, super-efficient city car hatchback. I'm talking about the BMW Z13 concept, which debuted way back in 1993. It has a surprising number of similarities to the i3, and unlike most outrageous concept cars, it actually came pretty close to production. The Z13 was one of several concept cars developed by the now-defunct BMW Technik skunkworks division during the 1990s that seem kind of ridiculous today. There was the E1 electric car, which looked like a cross between a Honda CRX and a Geo Metro, the bonkers SUV-like convertible Z18, the Z1 shooting brake, the downright French-looking Z22 MPV, and perhaps my personal favorite, the motorcycle engine-powered Just 4-2 sports car, which kind of looks like BMW's take on the Plymouth Prowler. I'll throw in a picture of that car because I think it's hilarious on multiple levels. To quote our own Andrew Collins, it looks like something Zoolander would take golfing. Anyway, back to the Z13. That concept first debuted at the 1993 Geneva Motor Show, where it stunned audiences with its use of lightweight materials, rear-engine rear-wheel drive architecture, and perhaps most famously, its McLaren F1-style three seat setup where the driver sat in the center and two passenger seats were given generous legroom behind him. The idea was to see if all the room and luxury of a big BMW sedan could be packed into a super-compact space ideal for city drivers who wanted to save on gas. The Z13 was unlike anything anyone had ever seen from BMW, a car that had the potential to redefine what the brand was all about. Power came in the form of a 1.0-liter engine derived from the K-series BMW motorcycles that was good for 82 horsepower. That power was sent to the rear wheels via a rear-mounted CVT transmission. As Automobile notes, the car weighed a mere 1,830 pounds and could achieve 43 miles per gallon. It also showed an early example of the kind of "connectivity" that automakers are all about these days, albeit in kind of a 90s-tastic way — the Z13 came with satellite navigation, a telephone, and a fax machine. According to Bimmer Mag, who wrote a great piece on the Z13's history a few years ago, the concept car was fully drivable and very close to production-spec. In fact, everyone — from BMW engineers to dealers to the gushing automotive press — assumed that it would go into production, and anticipated it would arrive in showrooms eventually. Although the MINI built under BMW’s ownership went on to become the world’s leading premium compact car, the Z13 would have represented a major step forward had it gone into production. It was unlike anything on the market in 1993, and the industry has taken nearly two decades to match it. The 2005 Citroen C1 and Peugeot 107 as well as the 2008 Toyota iQ are virtual Z13 clones, while the 2009 Nissan Pixo/Suzuki Alto show its influence, as well. BMW itself took even longer to revive the concept, adding a model beneath the MINI only with the MegaCity due in 2013. I'll give you one guess what car the MegaCity turned into. That's right — the i3. When you look at the i3 and Z13 side by side, it's impossible not to see that the 20-year-old concept must have influenced it pretty heavily. Both have a similar shape, particularly their A-pillars and rooflines. Both are tall hatchbacks with big panoramic windows and short, stubby noses. Both have their engines mounted aft. And both are designed to be small, efficient premium vehicles aimed at urban buyers. Of course, there are some obvious differences. The i3 ditched the Z13's three-seat layout, and I have a feeling that had the Z13 entered production it would have done the same. 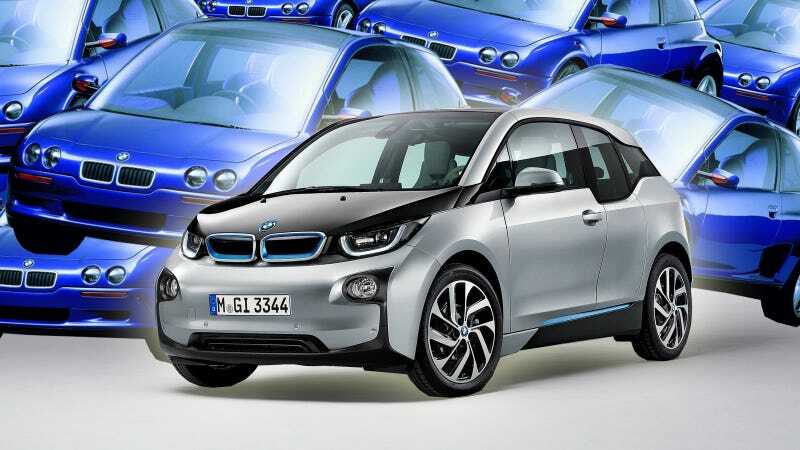 The i3 is also electric (with an optional gas-powered range extender) while the Z13 had a conventional gasoline engine. It's pretty easy, and not probably not incorrect, to think of the i3 as the modern descendent of the Z13. If you ask me, that's a good thing. Everyone thought the Z13 was a great idea 20 years ago. It's awesome to finally see it get its day in the sun. Now if we can just get a modern production version of the Just 4-2 or the Z1 Shooting Brake, the cycle of craziness will be complete.